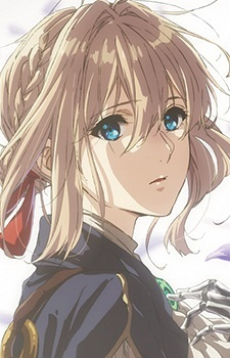 Violet Evergarden is the titular protagonist of the Violet Evergarden series. She is an orphaned former child soldier who was enlisted in the Leidenschaftlich army and fought in the war, where she was treated as nothing more than a weapon because of her extraordinary fighting capabilities. After the war, Violet became an Auto Memories Doll at the CH Postal Company, seeking to understand the meaning of the words "I love you," which was told by the person she holds dearest, Gilbert, during the War's final leg.